Shirts With Random Triangles: Texas A&M adds five-star WR prospect Damarkus Lodge to its 2015 recruiting class. This was Lodge's announcement of his decision to commit to Texas A&M on Twitter. 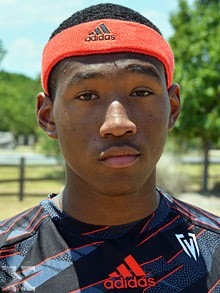 Here are Lodge's 247Sports.com composite intangibles: Lodge is rated as a five-star WR. He is ranked as being the fourth-best WR prospect in 2015. He is the sixth-best overall prospect in the state of Texas, and the 35th-best prospect in the U.S.
Lodge attends Cedar Hill High School in Cedar Hill, Tx. (Ironically, the team nickname is the Longhorns.) He stands six feet, two-and-a-half inches, and weighs 190 lbs.